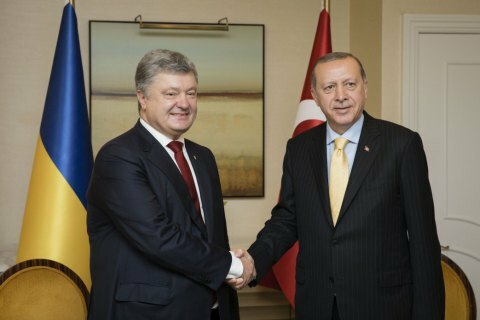 The Turkish president handed the list of 90 Ukrainian political prisoners for exchange over to Russia. Ukrainian President Petro Poroshenko and his Turkish counterpart Recep Tayyip Erdogan have agreed to coordinate efforts on securing the release of Ukrainians who were imprisoned for political motives in Russia and Russia-annexed Crimea. They said this at a joint briefing in Istanbul following the 7th meeting of the Ukrainian-Turkish high-level strategic council. Erdogan said that he had received a list of political prisoners from Ukraine and sent it over to Russia. He repeated that Turkey "has never recognized and will not recognize the illegal annexation of Crimea" and will continue to protect the rights of Crimean Tatars, both staying in Crimea and those who had to leave it. Ukrainian MP Mustafa Dzhemilyev, who is the president's representative in charge of Crimea Tatar affairs, said there were 90 Ukrainian political prisoners on the list for exchange. In October 2017, Russian released prominent Crimean Tatar activists Akhtem Chyyhoz and Ilmi Umerov from prison and handed over to Turkey. The agreement on their release was reached during a meeting between Erdogan and Russia's Vladimir Putin.